On a daily basis, how much time do you spend with your eyes glued to a screen? Most of us can't give a definite answer, but it's probably too much anyway. And sure, it might seem counterintuitive for a tech giant like Google to want you to spend less time fiddling with your phone, but apparently, that's the direction where Android P is headed. 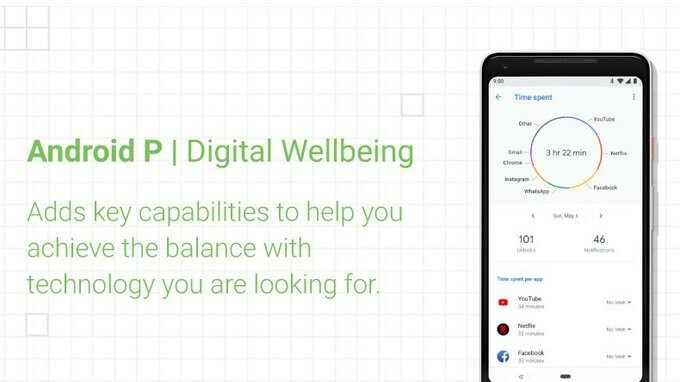 Digital Wellbeing – that's one of the pillars upon which Android P is built. It is an initiative meant to provide insight on how you use your phone, and if it is needed, it can help you cut down on screen time. The path to achieving balance with technology begins with the new Dashboard screen, giving you at-a-glance details on how much time you've spent on which apps, how many times you've unlocked your phone, and how many notifications you've had pop up. Per-app details are also available, and developers will be able to implement these in their apps. For instance, the YouTube app will provide you with information on how many minutes of video you've watched, be it on mobile or desktop. Realizing you have been spending too much time watching fail videos is one thing. Dealing with a bad habit is a whole different story. That's why Android P is adding an App Timer feature. In a nutshell, you tell it how much time you wish to spend on a particular app within the day, and the software will nudge you if that limit is reached. That app's icon will remain grayed out for the rest of the day. You'll be able to use it if you want to, judging by the demo, but you'll know that you probably shouldn't. Distracting notifications are also being taken into account in Android P. Once enabled, Do Not Disturb mode will filter them out. But what's even cooler is how you enable the mode in the next big Android release – flip your phone face-down on the table, and boom, you're in DND mode. Of course, priority contacts will be able to reach you even then if you allow them. Finally, Android P is making it easier to let go of your phone before bedtime. Google is adding a new mode called Wind Down, which turns the screen to black and white at a predefined time at night. Since black-and-white images are less stimulating for the brain, putting the phone away should be a lot easier. Digital Wellbeing is going to be a long-term initiative for Google, so these four additions to Android P may not be the last designed to help us find a better balance with technology. The new Dashboard, App Timers, the new DND gesture and Wind Down will launch as part of the new Android P update this fall and will become available on Google Pixel phones first. Bad news for the trolls here. Hmm, this sounds interesting. I do wonder how the results would look for me. I absolutely love this but the AI assisted call was too much for me. Like who are we that we are that busy to have to use an assistant to make calls and set up appointments for us? I'm sure it will have it's uses though but I'm just speaking from a personal perspective. How far will this stuff go? Yes. Higher ups. They have real people. Why does everyone need an assistant especially one that isn't human? Just too much reliance on technology for my tastes. This is dope. iOS version should be following in suite. We are travelling down the path of using our electronics more so than talking to each other personally. The new agenda is to put the devices down and let the AI handle most of the interactions. lol, addicts. putting your phone down is compatible with every phone ever, and bug free. Love the idea the assisted calls, that would save me a lot of time, if it works of course.